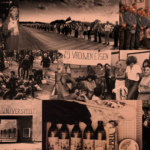 Exactly sixty years after the Hungarian Uprising in October 1956, the Iron Curtain Project starts with a traveling pop-up museum about Protest in Europe. 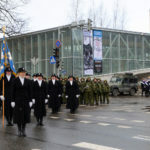 It raises the question: what do we Europeans want to fight for? "I saw the statue of Stalin being pulled down. 'Woooooooo' it sounded from thousands of mouths at the same time. It felt like a volcanic eruption,” Laszlo Baranyi (1926) says about the Hungarian Revolution of 1956. Change can start with an angry scream of a single person or a simple song being sung by thousands. A revolution can begin with a lighted candle or protest signs in the hands of countless people. 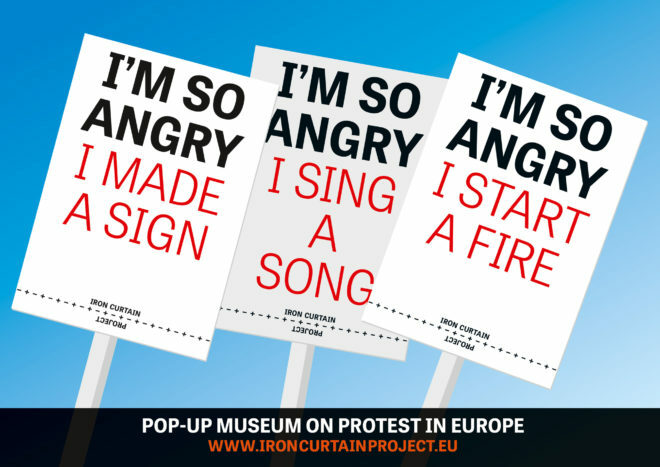 The I’m So Angry (I made a sign) Pop-up Museum is an exhibition that pops up for a short time in different cities through Europe. The exhibition tells the personal stories of people who joined one of the protests that shaped Europa. It shows the symbols they used and asks the question: what are we willing to fight for nowadays. A protest is a powerful tool for the powerless. When the difference between the dreamed future and daily reality becomes insurmountable, people revolt. They awake from their lethargy or overcome their fear and decide to fight for their ideals. Newspapers and television channels spread the images of their protests. We see masses of demonstrators, moving as a single organism, but when you look closer, you see individuals. A student of mathematics, a mother with her child, a retired steelworker, a middle-aged man who has just lost his job; people who, independently of each other and for their own reasons, decided that that day, their patience had come to an end. This exhibition introduces you to these individuals from across Europe. Meet for example Constantin Jinga: he was shot during the Romanian Revolution but still calls that day one of the happiest of his life. Or read about Mirka Chojecki-Nukowska, who did not feel like a hero, but still put up resistance – until she had to flee Poland. Meet the people who forgot their fears and accidentally became heroes, who fought in revolts that changed the world or ended in repression and disillusion. Their personal stories inevitably raise the question: what would I have done in their place? It is an important question, maybe now more than ever. Because what do we really wish for our country’s and our children’s future? There is a considerable mood of discontent in Europe, but what is it that we want to change? Or do we, above all, want to keep what we have, no matter what the cost? When do we say ‘enough is enough’ and do we take action? In this exhibition, we will ask you straight up: What are you angry about? Welcome to the I’m So Angry (I made a Sign) Pop-up Museum. Read the stories, join the free workshops and show the world your own protest sign in the video booth. 18 – 20 August 2017, Lowlands Festival, The Netherlands. 1 november 2018, '18-69-18' by Duitslandinstituut, Melkweg Amsterdam, The Netherlands. 11 December 2018 - 7 januari 2018, Centre Céramique, Maastricht. More cities and dates will follow. If you are interested to have the Pop-up Museum at your event or venue.